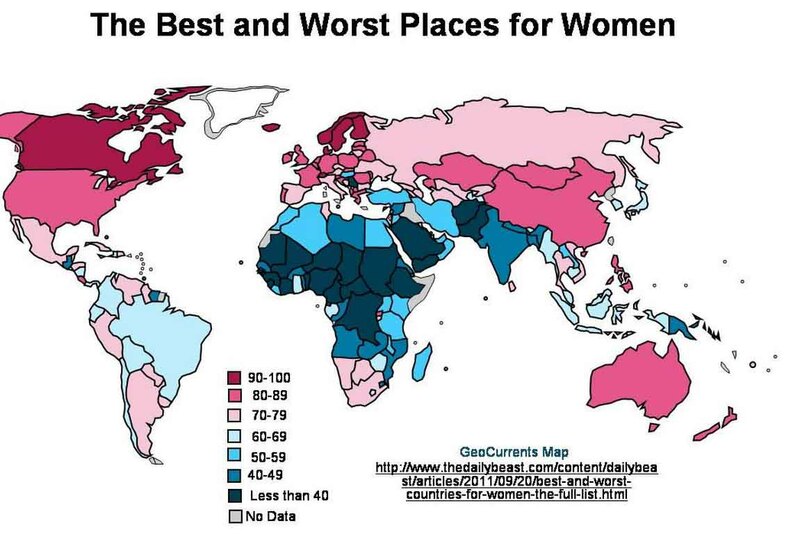 According to Forbes.com, Canada is the best country in the world to be a woman, and India is the worst. The U.S. was ranked #6 of the twenty countries surveyed. The members of the G20 are Argentina, Australia, Brazil, Canada, China, France, Germany, India, Indonesia, Italy, Japan, Republic of Korea, Mexico, Russia, Saudi Arabia, South Africa, Turkey, the United Kingdom, the United States and the European Union. Starting with the I Ching, The Book of Changes, almost five thousand years ago, the central focus of Chinese philosophy has been how to live an ideal life and how best to organize society. When the Communist Party of China gained power in 1949, previous schools of Chinese philosophy, except Legalism, were denounced as backward and purged during the Great Leap Forward and during the insanity of Mao’s Cultural Revolution. Most Chinese think that true advancement and growth should only happen slowly, at a steady, measured pace, which means to grow but grow slow like an oak tree while following a well thought out plan to bring about change. Even the United States doesn’t change that fast. In fact, it took almost ninety years to free the slaves, and women first sought the right to vote in 1848 at the Seneca Falls Woman’s Rights Convention. Then seventy-two years later in 1920, American women finally earned the right to vote when the Nineteenth Amendment was adopted by Congress and was ratified by the states becoming a national law. The last time women had relative freedom in China was in the seventh century during the Tang Dynasty when Emperor Wu Zetian, a woman, ruled the country. Since 1982, when China ratified its Constitution, women in China have gained more freedom, power and rights than at any other time in China’s history including the Tang Dynasty when Wu Zetian ruled as the only female emperor in China’s history. Anyone that does not consider this progress is stupid, blind and deaf. Critics in the West have pointed out that under the Communists, no woman has ruled China, and I’d counter that no woman has ever ruled the United States—yet. In 2013 Lin Yandong, a senior Party official responsible for winning over non-Communists, was elected Vice Primer of China, one of the country’s senor leaders. She’s now one of China’s four vice premiers making her not only the most powerful woman in China, but also one of the most powerful in the world. She is one of two women in China’s 25-member Politburo. The other woman is Sun Chunlan. “Chinese women leaders have much in common. They generally all have a good education background, being mainly science majors, and solid experience in government. They are of a caliber equal to that of their male counterparts,” an All-China Women’s Federation expert said. For the United States, I’m thinking of Sarah Palin—enough said. If you hear anyone demanding faster change in China, be cautious. After all, China seems to be moving faster than the United States when it comes to women holding positions of power. Why do so many of China’s critics in the West expect China to move faster than the United States? The teacher wants her students to know the alternatives so they have choices. She says, “You don’t change overnight. It takes time. The ideas have to sink in.” This also applies to a country where less than a century ago women were the property of men and their feet were broken as children and bound to restrict growth. Moreover, this is happening in Communist China and most Western critics have no idea this is going on. After all, men and women are equal under the law in China, but there is a long way to go to change the old habits and ways of thinking to achieve all that equality offers. As in the US, women in China are not paid the same as men for the same jobs. Dramatic changes in women’s rights have been achieved in a culture where for millennia women were stereotyped as inferior to men, had no rights and served as slaves, concubines and prostitutes. Marriages were arranged—sometimes at infancy. In 1949, foot binding was abolished; the All-China Women’s Federation (ACWF) was formed and supported by China’s Communist Party (CCP). Change in China, as in the United States, has been a painful evolutionary process. However, the struggle for women to gain equality appears to have moved faster in China since the CCP came to power. After the CCP was established in 1949, it took less than a year to liberate women and pass laws to speed this process along. For a comparison, after the United States was established in 1776, it took one hundred and forty-four years until August 26, 1920 when the Congress voted in the 19th Amendment to the US Constitution giving women the right to vote. It was also been reported that domestic violence is a severe threat to women. Chinese authorities reported 50,000 complaints annually, according to figures released by the ACWF. The domestic violence fact sheet shows this is also a problem in the United States. Sexual discrimination was supposed to have been abolished in China back in 1949, when Chairman Mao Zedong famously announced, “women hold up half the sky”, but it wasn’t. It has only been a few years since China outlawed sexual harassment. Laws may be written to bring about change but change comes slowly. Today, statistics show China has about 27,000 women and children’s rights protection agencies. However, China’s critics and enemies will only point out what they believe is wrong without giving credit to what has changed for the good of women in China. In Party Women, I wrote how women in China have more freedom than at any time in China’s history and pointed out how many held important political posts in China. I was correct when I said how China has been criticized in the Western media for not having enough women in positions of political power at the national level. However, what I didn’t know was how wrong China’s critics were. According to the UN, China has a higher percentage of women in positions of power at the national level than all but one of the countries I researched for this post. In the United States, women hold less than 17 percent of the seats in both houses of Congress. In China’s National People’s Congress (NPC), women hold 21.3 percent of the seats. Since there are 2,909 NPC deputies, that means there are about 620 women in positions of power at the national level. In the United States, that number is about 100. In Japan, a democracy, only 11.3 percent of the 480 members in the House of Representatives and the 242 members in the House of Councilors are women, which is eighty-one. In South Korea, another democracy, there are 299 seats in the National Assembly. Only 15.6 percent or forty-six are women. In Thailand, there are 62 women out of 474 seats—about 13 percent. There is only one country in Asia that has a higher percentage and that is Singapore with 23.4 percent of the seats in its parliament held by women. There are almost 20 women of eighty-four elected members. When it comes to building a government of the people from scratch, it now makes sense why Singapore is China’s role model instead of the US or the other Asian democracies. In fact, China has twice as many women holding important positions of power in China’s NPC as all of the other countries mentioned in this post. Moreover, this is happening in Communist China and most Western critics have no idea what is going on. The rural teachers study the Chinese Constitution to learn about their rights and responsibilities. After all, men and women are equal under the law in China, but there is a long way to go to change the old ways of thinking to achieve that equality. The changing role of Chinese women has been dramatic since Mao won China in 1949. 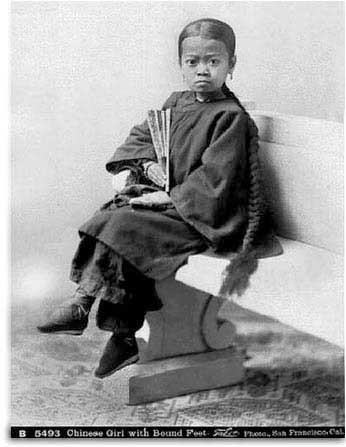 Prior to that time, China was ruled by the Kuomintang—a dictatorship. There were never national elections held in China. There wasn’t much that changed under the Kuomintang leadership regarding the role of women. When my wife was born in the late 1950s, her grandmother had bound feet. Before Mao, women were grass to be stepped on. Their role was to serve men. The changes ushered in by Mao set the stage for his wife to become China’s leader after her husband’s death. The only reason she did not assume the leadership was because she was arrested as a member of the Gang of Four and sent to prison for crimes committed during the Cultural Revolution. Since Mao, the changes have been even more dramatic. Woman own businesses, hold political posts in the government, have jobs, and cannot be sold to become a wife or bought to serve as a concubine. They are not property. They are equals to men in many ways. Learn about Marriage and Money in China.